Being a change agent- Ensuring lasting organizational transformation. A review of the last 20 years studying the greatest influencers in the world; Gandhi, Christ, Martin Luther King, Mother Teresa, Suu Kyi, Benazir, Bhutto, Margaret Thatcher, Rosa Parks, John Maxwell, M. Scot Peck, Jack Welch and many others – shows it wasn’t just what these people did that made them influential. It wasn’t because they had money, position or authority. They were influential because of who they were or are and the traits they possess. BEING influential is not manipulative or commanding. It is servant. Webster defines influence as the act or power of producing an effect without apparent exertion of force or direct exercise of command. Through this definition, the difference between influence and dictatorial command are delineated. Command can initiate change of mind, but it is externally motivated. As soon as the external consequence is lifted, the status quo is quickly resumed. Influence creates an internal shift in a person’s mindset. Internal commitment is gained independent of external consequences. The world’s most influential people don’t merely change other’s behavior; they transform their own mindsets. Suppose you own a retail store and an employee continues to not greet customers in line with your culture. Command says, “Do this or you’ll get fired or written up.” Influence says, “Let me show you why this is important to your success and mine.” The employee who is commanded to greet customers will do so while he or she thinks you are watching. Your customers will see through the veneer, as well. The employee who is influenced will begin to sincerely greet customers regardless of your presence because an internal shift has occurred. Successful influencers know that action is an important aspect of success. In addition to what they do, they also possess a combination of traits that compel others to listen, believe and follow them. This combination of traits did more than just create short term changes – it shifted lives! 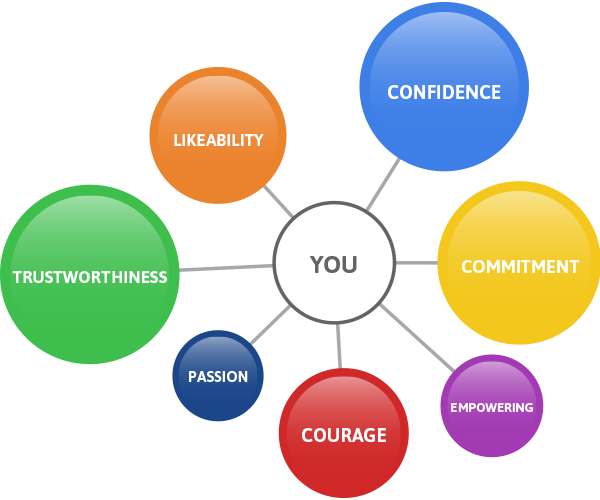 Everyone possesses these Seven Influence Traits™ to varying degrees; it’s the strength and mix of these traits that affect your influence potential. Confidence is having the ‘whatever-it-takes’ attitude. This is your mental attitude of believing in, trusting in, and relying on yourself and your abilities. Commitment is the underlying force behind achievement. The more determined you are to reach a specific goal, especially in the face of adversity, the more likely you will succeed. Courage is your strength to face difficult circumstances (or even difficult people) head on. Passion is the fire in your spirit for what you do. It is the expression of your enthusiasm and your eagerness, and starts the engine for your success. Empowering is your ability to support peers and share knowledge with them. It also includes how you reward people who make a contribution. Trustworthiness is a high virtue, and is fairly self-explanatory. It is worth noting though that of all the influence traits, this is usually the most crucial. Lose trust, and you instantly lose influence. Likability is more than being friendly. It’s your capacity to create positive attitudes in the people around you, and focus those attitudes towards a common goal. For a free trial report, multi team reports or more information please contact us.